Contents in this post are the same as the one in my other blogpost in a separate blog [on Junk] - click on that if you want to go to that blog. I am posting it here also because it is related to the subject of Garden. My workplace is in a century old palatial building that was built by the Mysore King. Some years ago, they were replacing the entire original mosaic floor of a room. The beautiful little chips in perfect geometrical shapes and dimensions were being broken. It was an exercise too difficult to watch and I wish not to divulge into detail. That is one of the three mansions built for the three Princesses at that time. All the structures are a delight to connoisseurs. Their interiors are exquisite. 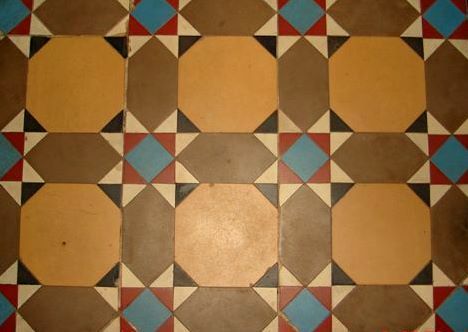 Just to show how varied the patterns and colours were, in many such palatial buildings, let me show you the flooring of the other mansion [Karanji Mansion] which I visited some time ago. This was not in good shape. Now it houses the PTC. Now let me come to ours. 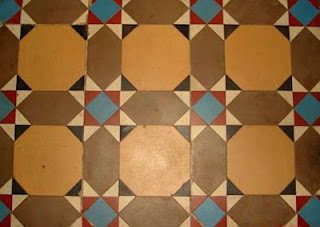 Pictured below is a portion of the original floor and design the entire floor area had. Observe the shapes and colours. They had been imported from England at the time of building these mansions. Such mosaic floors of that period are so pleasing to the eye. The broken floor debris were being heaped in the room to be loaded to trucks for landfills. So sad. Being a lover of heritage, I thought of preserving a tiny portion of these chips in my home. In "Dave's Garden" I had seen what gardeners create with mosaic chips. So I randomly picked up some of those to try my hand. Mosaic art is a vast and creative subject many gardeners and hobbyists do for passion. Five distinct patterns were made from the available good chips and embedded the 'stepping stones' in my yard, after proper curing. The following picture shows the work I did in the centre of our living room with better pieces. But now we can see only one half of it. Shortly after this was created, it so happened that a wall ran through the hall at that very spot. Picture below shows the base for the wall getting ready. Observe the visible portion of the tiles. It's too bad your creation had to be covered. I like how you salvaged those bits to preserve their history while beautifying your home both inside and out.